This week (or these weeks I suppose) I don’t have a link or comic to point you to, but rather one opportunity and one suggested resource! Instagram… As follows of this blog may have realized, I virtually never link out to Instagram. The reason for this is because it already takes an ever-growing amount of time to capture what I find and Instagram would push it over the edge. However, I DO follow along when I have a chance and I want to encourage you all to do the same. 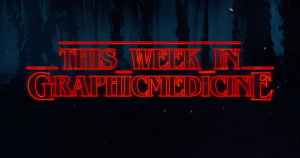 You can add the hashtag, #graphicmedicine, to your feed (a neat feature) and follow Graphic Medicine‘s presence as two quick, easy ways to get started! Are you a book reviewer or do you have aspirations to be one? Then we at Graphic Medicine may have an opportunity for you! As you know, book reviews are a major feature of this website. As you also may know, we find ourselves more-and-more busy and unable to review as many as we’d like. This is where you come in! If you might be interested in reviewing a work of graphic medicine (floppy comics, graphic novels, webcomics, beyond), please reach out to us! You can contact us directly individually of course, but the best way is to send us a note using this form. Special… Consider checking out the #GoldMTL and/or #MLANet18 hashtags if you have an interest in humanism in medicine or medical librarianship respectively. Both of these professional gatherings included reference to graphic medicine! Paid Project: TCAF x Entreviñetas Present: The Blind Date Project! Apply Today! Comic Excerpt: Going to sleep isn’t always easy, even when you’re tired. Here are ways to combat insomnia. Scholarly: Concerns With Entertainment-Education: Zombie Pandemic Preparedness and the Unanticipated Promotion of a Weapons Culture. Blog: Primary Care as Adventure! By Richard Stark, MD. Blog: More Lynda Barry and Michael Green! I backed that the moment I saw it! I’ve been waiting for an educational comics only version of OJST for years. I haven’t figured out backing Kickstarters as the library yet but if I do before it ends I’ll get it. @kaitly_n This was a post on the NLM National Library of Medicine’s news https://t.co/CHKM9LvswE It’s about Graphic Medicine. You can pick up one of the latest @MedLibAssn publications at #MLANet18 on consumer health collections (at a discount!).
. @pfanderson ask about model for consent and the use of #GraphicMedicine in the informed consent process. Our blog highlights for May! For our BOTM we chose Let Me Be Like Water, a raw debut novel from @_sarah_perry, spotlighted Rock Steady for #MentalHealthAwarenessWeek, & read poetry with Take Me With You ahead of @andreagibson‘s UK tour.